Was Your English Lit Teacher Wrong About Symbolism? You always wondered if your college lit professor was just making crap up. Turns out, maybe they were. This article from The Paris Review offers a revealing take by many famous authors on how much symbolism played a part in their work. Their comments were prompted by a letter from a 16-year-old Bruce McCallister in 1963. He was tired of the constant find-the-symbolism game in English class, so he took it upon himself to ask them what the big deal was with symbolism. In addition to following me on WordPress, you can now follow me through Bloglovin’. 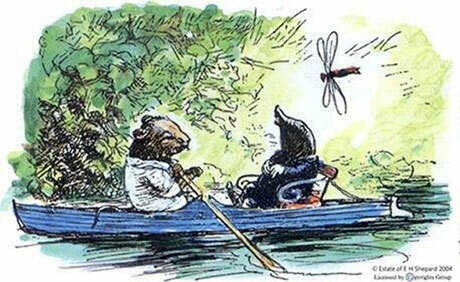 Adventure is always calling in The Wind in the Willows. Mr. Toad dreams of speeding along paved roads in a motorcar, Mole longs to row a boat on the River Thames, and Ratty is enchanted by the Sea Rat’s travels. Animals that are the most suited for one kind of environment do not belong in another. Yet, Kenneth Grahame’s animals in The Wind in the Willows are quite anthropomorphic. At times, characters like Mr. Toad can even pass themselves off as human. Late December and early January – when one year comes to a close and a potentially more exciting new year begins – are indeed the best times to read this novel. Stuck between the memory of the past and the expectations of the future, the reader will feel the most in company with the animals of the Thames Valley.